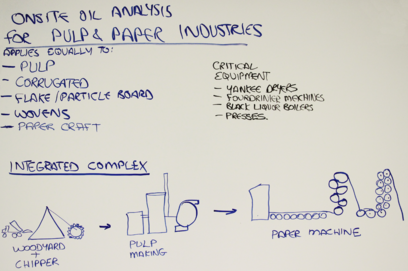 The variety of equipment in pulp and paper plants makes on-site oil analysis a natural fit for this industry. When the lumber comes in, chipper equipment is used for shredding and chipping, and the pulp facility houses chemical separation systems such as black liquor boilers. Pulp is delivered to the paper machines used in these plants can cost upwards of several million dollars. The paper machines include many moving parts such as rollers and spreaders that operate at very high speeds. With all of the moving parts required to keep pulp and paper plant operational, downtime is not an option. The operating conditions for pulp and paper mills are similar to other industries, though a few differences exist. The number of high speed machines needed to complete the entire process in pulp and paper facilities is often higher than other industrial facilities. A high degree of heat is generated by these machines and the dust created during the process is a factor in the contamination of the oil. With so much dust being generated, it is almost impossible to not have particles appear in the oil. And, since there is high humidity in the facility, especially in the wet end of the paper mill, since it is critical to remove the moisture from the pulp before the process starts. Humidity can reach 80% or higher in the facility, water ingression is always a concern. As a result, reliability and maintenance managers have fully embraced predictive maintenance as a critical tool to extend equipment reliability, improve mill conditions and increase cost savings. In the pulp and paper industry, there are many advisory councils. One such council is TAPPI (Technical Association for the Pulp and Paper Industry). TAPPI has been around for almost a hundred years and has provided significant support for the industry by developing technology solutions to unique paper making process challenges Because of the high speed bearing systems, the pulp and paper industry was one of the first industries to truly embrace predictive maintenance technology. Some of the recommended technology included vibration analysis, infrared thermography, motor current evaluation, oil analysis (traditionally off-site but more on-site), laser alignment, ultrasonic acoustic emission monitoring, and even online sensors. All of these condition monitoring solutions have been used for years, and maintenance managers are well-versed in the benefits of predictive maintenance technologies. Oil analysis has been a widely accepted technology for pulp and paper plants and on-site oil analysis is also widely used. Continuous production in a pulp and paper mill is critical and maintenance managers need results immediately, particularly if they suspect an equipment problem. They also want to have comprehensive data before they decide to shut down a piece of equipment. To cease operation, particularly on a paper machine, means the entire system has to be brought down if a maintainer takes out a roller or a bearing. 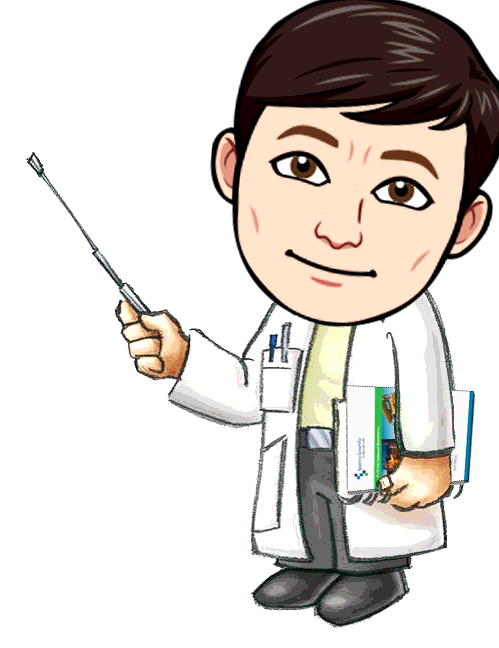 Moreover, maintainers want to confirm findings and expand their knowledge. Many mills also added on-site or online sensors on some of their critical reservoirs and on their critical bearing systems. Many have adopted online sensors, such as particle counters and, in some situations, ferrous devices. However, if anything is creating an alarm, the maintenance managers want additional information from a comprehensive set of tests before they take a machine offline. Pulp and paper mills already have solid reliability teams in place. Many sites employ oilers and lubricators. These personnel or other well trained technicians draw samples, run the tests using on-site oil analysis, confirm the alarms, create additional action items, and complete the assigned work orders. 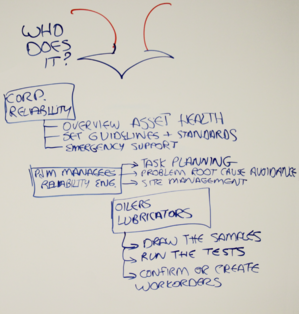 Also, the reliability engineering group and PDM managers, who focus on root cause avoidance and analysis, are responsible for task planning and overall site management. Most organizations in this industry have a corporate reliability function at their headquarters. This is a highly trained team focused on asset health throughout the organization. They set guidelines and standards for the mills, so all the team members are on the same page and they also provide emergency support when a mill needs help or additional resources. Machinery lubrication is a concern for on-site oil analysis in pulp and paper mills. A particular class of product designed for paper machines is called PMO's, or Paper Machine Oils (PMOs). They're supplied by most of the major oil suppliers and they are used on two ends of very large paper machines. Both wet end and the the dry end include a series of bearings and rollers. From a lubrication perspective, the oil in the wet end needs to have good filterability and very strong water separation/removal, because of the presence of wet pulp. Other requirements are good anti wear, corrosion inhibition, and process chemical compatibility. On the dry end it's slightly different because the key concerns are oxidation stability, foam control, thermal stability (on the hot section), deposit control (in case any deposits are from wear debris), and water separation. As a result, oils developed are designed to meet both wet and dry end demands. It's a combination of the best of a hydraulic oil and the best of the gear oil with added strengths for conditions such as wet environments. 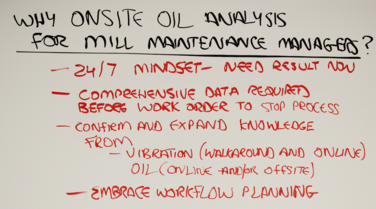 Most mills select oils that will meet all these criteria because they want to have one oil throughout the machine. The main paper machine is a system of rollers, motors, and drives, so paper machine bowsers, bearings, hydraulics, and motor bearings should all be considered for oil analysis. These machines generally run clean, so one of the big issues is water ingression, due to the wet and humid environment of the paper mill. Viscosity, oxidation and acidity are important because they indicate and affect the potential for corrosion and film strength. Particle count is an important parameter due to the tight clearances in several of these valve filtration systems. Similarly, ferrous particle count can catch any possible wear, especially on geared systems at the back end of the machine. These machines require consistent monitoring, and most mills perform monthly testing. Water ingression needs constant monitoring since paper mills operate 24/7, and seal integrity is always changing. Some mills are located in remote areas with very hot summers followed by very cold winters. These conditions affect the way the machines operate and they can cause equipment issues if not properly maintained. Supporting equipment includes gear drives, conveyor belts, stackers and grease bearings. Some of the equipment is actually exposed to elements outside rather than inside the mill. 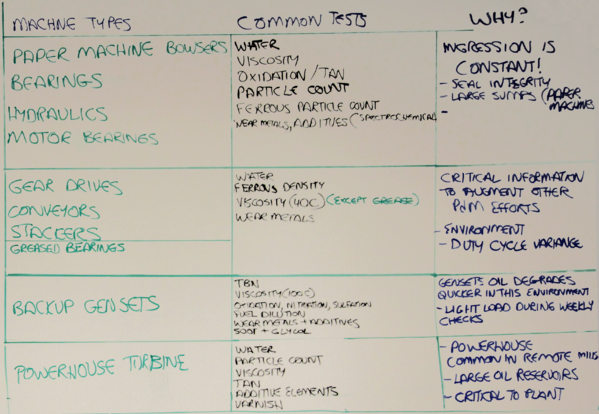 Water, ferrous density, and viscosity are critical test parameters. Grease is not as much of an issue, though it is important to consider the identity of the grease. Wear metals must be monitored for proper maintenance, even though the environment duty cycle changes. Many mills in remote locations require special power requirements. In some cases, even if the mills are on the power grid, their power demand is so large they must produce their own power or have a relationship with a local power company. Even with these options, every mill needs a backup genset in the event of power loss. If a mill loses power by accident, serious damage can occur and it can take a long time to bring the mill back up. in addition, the equipment has to be cleaned before the machine is operational again. Backup generators are routinely monitored because they are only lightly loaded when routinely checked. Base number, viscosity, fuel dilution, oxidation, wear images, soot, and glycol are tested on a regular basis. In large facilities with their own power houses employing gas turbines or steamed turbines, water, particle count, and viscosity are critical. Acid number, additive elements, and varnish are also important, in addition to ferrous or particle count information. 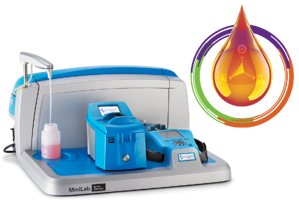 In all pulp and paper mills using on-site oil analysis, our recommendation is the MiniLab system. There are different models depending on the mill size, ranging from a MiniLab 53 to a MiniLab 153. In addition, we recommend the TruVu 360 ™ platform for asset management due to the amount of assets used in pulp and paper facilities.